Found 2 file extension associations related to Legend of Kyrandia 2: Hand of Fate and 1 file format developed specifically for use with Legend of Kyrandia 2: Hand of Fate. If was to say Hand of Fate is best game ever created, I would probably be wrong (taking into account other great titles like Quest for Glory 1, Dragonsphere, and so on). That's why I'm going to say it like this: Hand of Fate is one of the best games ever created. 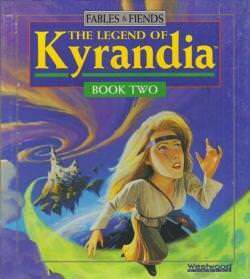 This excellent game is the sequel to Legend of Kyrandia 1, and the predecessor of Malcom's revenge. In my opinion, HoF is the best game in the series, although I only played a small part of Legend of Kyrandia 1. But enough of that as this is a review for HoF, and not some other title in the series. In this second part of the trilogy you play the part of Zanthia, the youngest of the order of Kyrandia mystics. The story goes like this: Kyrandia is slowly dissapearing (trees vanishing into thin air right before your eyes and things like that). The only solution to save the land is to find the anchorstone, located in the centre of the world. You start the game in your hut. This is when you find out that all your belongings have been stolen. The hut is trashed and Zanthia is very upset. The first two things you need to obtain are the cauldron, and the recipe book. With these two, you will be able to concoct all sorts of potions, which you will need throughout the game. There are numerous puzzles, many of which are not simple, and require some neurons to be wasted :) However, there are also some puzzles which can be solved only by trial and error, simply because you don’t know what you're supposed to do. You're all probably wondering what's so great about this game. Well, where do I start? Graphics? Stunning! Just look at the screenshots to the right, they say a million words. There are also wonderful animations. The game also has a short intro movie, which describes the desperate situation very well. The music is simply gorgeous, and the sounds are great. Also, the game is very fun to play. In fact the graphics style and the humorous dialogues are characteristic of Westwood, so if you haven't played any of their games before, this is an excellent opportunity to do so. I'm sure you won't be disappointed! Anything else I'm forgetting here? Oh yes, what's the hand doing in the title? Well, the hand helps in some parts of the game. In fact it helps you right at the beginning, by telling you where to get the anchorstone. The Legend of Kyrandia 2: Hand of Fate software seems to be old or discontinued. If you need more information please contact the developers of Legend of Kyrandia 2: Hand of Fate (Electronic Arts, Inc.), or check out their product website.